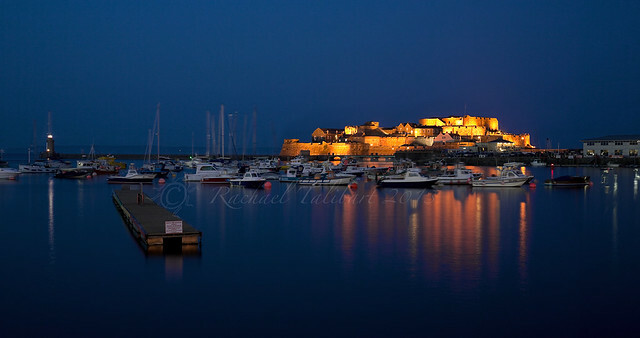 Castle Cornet, Night | Flickr - Photo Sharing! 75Central Photography, jomak14, and 19 other people added this photo to their favorites. Beautiful light and reflections Rachael. What a fabulous place to photograph....You have done it proud Rachael!! beautiful dreamy capture with fantastic lighting and reflections,top shot..
Real depth in the colours made by those reflections; beautiful image. Love this Rachael. Well controlled exposure and some beautifully rich colours. This is excellent, Rachael. I love the gold and blue colours. A romantic vista with the castle all alight and the beautiful reflections of the boats on the still waters. Thanks for your comments. Good to see you here again. I hope to post at least once in awhile, but not as often as I used to. Congrats on finishing your dissertation! And on getting the camper van!!! Now for some fun trips I hope. We've visited Guensey many time - a lovely island. Beautiful night shot of the castle - lovely composition and exposure. Lovely example of low light photography. What a beautiful sky!